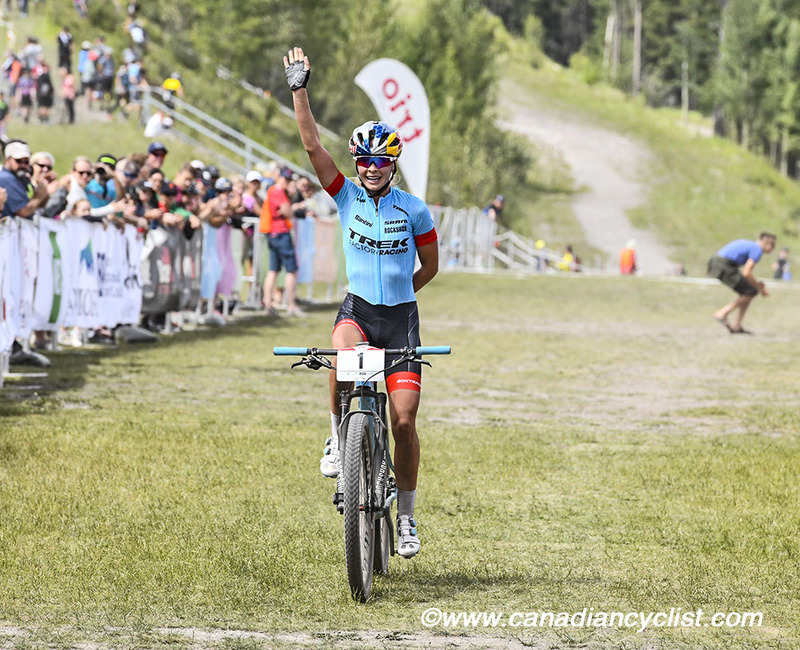 The 2018 Canadian XCO Championships saw both the women's and men's Elite champions successfully defend their titles on Saturday at the Nordic Centre in Canmore, Alberta, with Emily Batty (Trek Factory) winning the women's title and Peter Disera (Norco Factory) the men's. The four kilometre circuit offered a spectacular backdrop of the Kananaskis Country mountains leading into the Banff National Park. Riders faced both steep climbs and technical, rocky descents, that saw more than one rider crash or suffered punctures. Batty, coming off back-to-back top-3 finishes in World Cup competition, was the clear favourite as she went for her fourth Elite title, and the third consecutive one, especially with her usual rival Catharine Pendrel (Clif Pro Team) on the sidelines recovering from injury. She opened a gap on the start loop and never looked back, extending her lead throughout the race to win by 3:40. "It was a great day," said Batty. "The other girls put a lot of pressure on for the first couple of laps. I've had a lot of travel, so I wasn't sure, but I had a lot of good sensations today. It's a track that if you lose focus for a second, you will hit the dust, so I treated it like a World Cup, and tried to get as much time as I could, because anything could go wrong." Behind, it was a battle between Sandra Walter (Liv Canada) and Haley Smith (Norco Factory). Smith carved out a lead in the opening laps, but then flatted, and was passed by Walter as she had a wheel change in the pits. However, Walter then extended the initial 15 second lead she held to finish 2:20 ahead of Smith. "It's been really exciting having some strong results in Europe," said Walter, "so it's cool to have that battle with Haley again. Her tactic seemed to be 'go with Emily', and my tactic was that I raced my own race. When I saw Haley coming back to me I had a renewed motivation, and when she flatted and I got by, it really motivated me and a I started pushing it on the climbs." 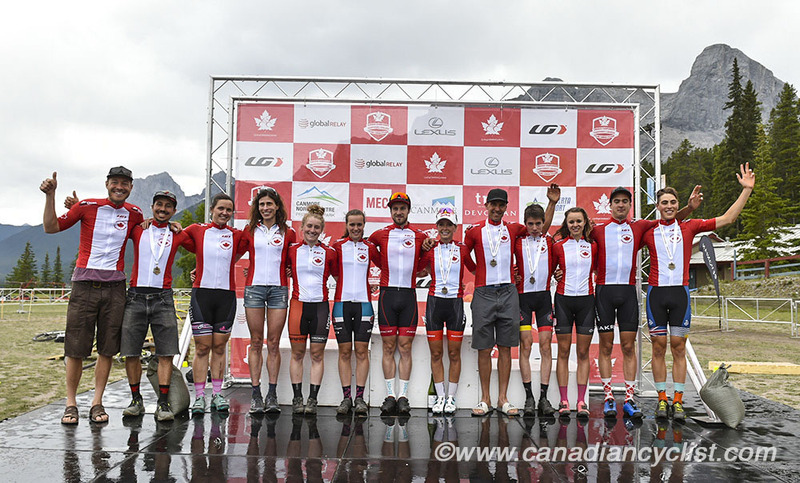 In the Under-23 race, Laurie Arseneault (ACQ) took the title ahead of Emily Unterberger (Pendrel Racing), with Sophianne Samson (CVM Sigma Assurance) finishing third. Roxanne Vermette (Equipe du Quebec) repaeted as the Junior women's champion. The Elite men's race quickly came down to a battle between Disera and Raphael Gagne (Silverback OMX). The two rode together for the first two laps until Gagne attacked, steadily opening a gap to 50 seconds by the start of the last lap. Unfortunately for Gagne, he started to suffer a slow leak in his rear tire as he came into the last lap. He went into the pit for a wheel change and was passed by Disera, and then fell further back as Disera powered on to win his second national Elite title. Leandre Bouchard (KMC-Ekoi-SR Suntour), despite crashing heavily in the first lap and gashing open his right knee, hung on for third. "I was so scared going into this race," admitted Disera. "I knew I wanted to defend but wasn't sure where the form was at. From the gun, I just decided I was going to stick it and went all out for the first 20 minutes. Raph was the only one to stay with me. Raph came around me and I was all of a sudden gapped. I stayed with it, but I was realistic, thinking I was probably second, and then I saw Raph in the pits changing a flat, and thought I had a shot. So, I just rode completely crosseyed the last lap. 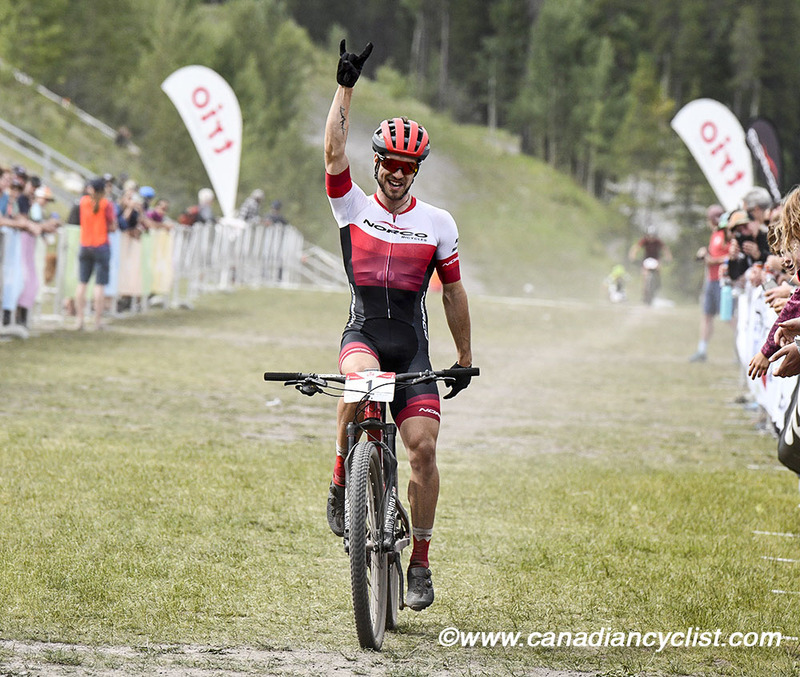 I feel bad because Raph was riding super strong, but as we saw when I broke a chain at the Horseshoe Canada Cup when I broke a chain, it's just racing, and not necessarily fair sometimes." "I have a lot of reasons to be happy, but one reason that is tough to swallow," said Gagne. "It's going to take a while to get over this one. But, I'd rather have good legs and not deliver, than the opposite, so I'm happy with my fitness. Today I was strongest I think, I proved it, but sometimes you need a bit of luck. That's racing." In the Under-23 race, Sean Fincham (Forward Racing Norco) rode away from the rest of the field and up through the Elite field - which had started two minutes ahead - to catch all but the first three Elite riders. Pivot-OTE riders Marc-Andre Fortier and Raphael Auclair took the other two podium spots. Carter Woods (Cycling BC) took the Junior men's title.